The above video was for Black Milk Clothing's first Harry Potter collection. It was so successful that a second collection was developed while I was on the team. In addition to new designs, best sellers from the earlier collections would be re-imagined on new and different garments to leverage their popularity. A number of my best selling designs were in these collections. Below are a small selection of the Harry Potter pieces I have designed. While we are a fair way off from having garments with animated people on them, I was quite pleased with how well this design came together. 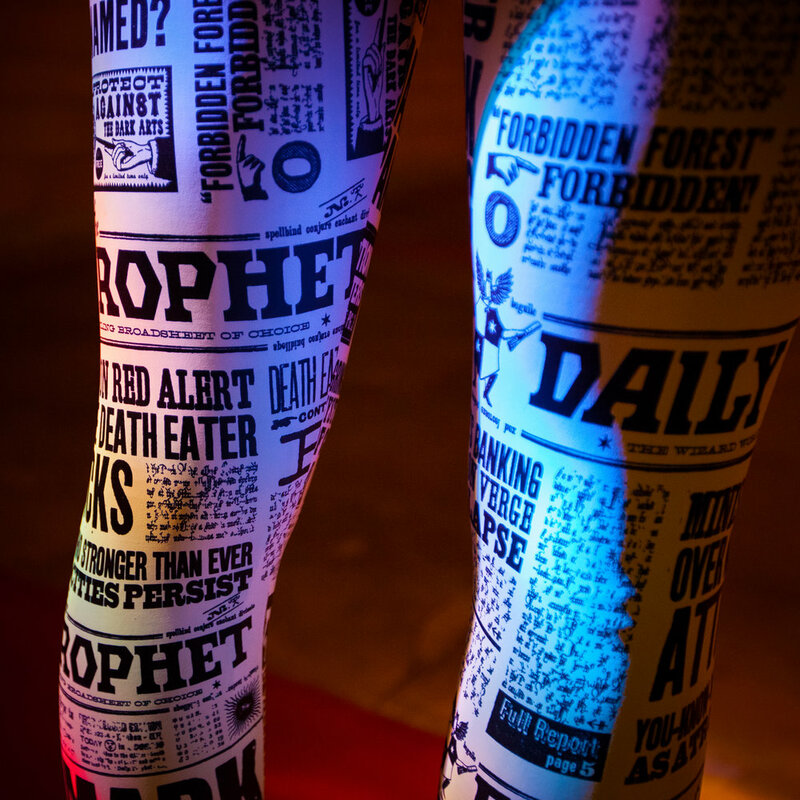 The somewhat chaotic orientation of the text not only allows for larger type to travel down the leggings but also reinforces the fantastical portrayal of the Harry Potter universe. I was asked to create a set of leggings and a bodycon dress (image left) that featured the Marauder's Map. Unfortunately there were no source images large enough to use without compromising clarity. So I recreated it all from scratch and included markers for the key characters in the show. Despite the skin tone of the design these garments sold very well. Perfect for quidditch matches or indeed any sport, these unisex jerseys allowed fans to role play the great rivalries depicted on film and in the books. Interestingly, determining the correct number and name for these garments was more difficult than I expected. Who for instance, is Ravenclaw's seeker? For those death eater sympathisers out there, they can revel in Bellatrix Lestrange's escape from the prison Azkaban. The deathly hallows are represented by an appealing geometric design featuring a triangle, circle and stroke. While the original mark is flat, I created a version that looked to be cast in a blue tinged metal which added depth and tone.